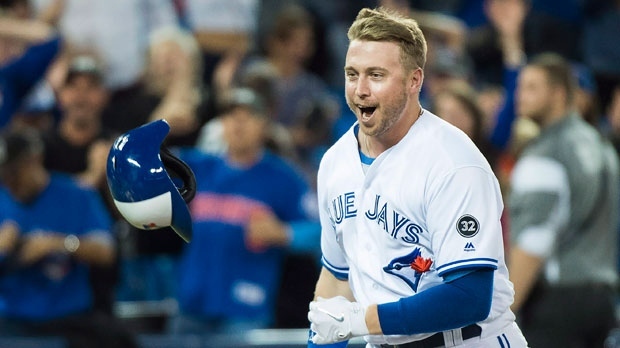 TORONTO - Justin Smoak hit a solo blast to cap off a seven-run ninth inning as the Toronto Blue Jays rallied from a six-run deficit to beat the Tampa Bay Rays 9-8 on Thursday night. Blue Jays prospect Rowdy Tellez had a two-run homer in the second inning and started Toronto's ninth-inning comeback with an RBI double to cut Tampa's lead to 8-3. Catcher Danny Jansen followed with a three-run blast to bring the Blue Jays (70-83) to within two runs. Lourdes Gurriel Jr., then had a two-run shot to tie the game with two outs and bring Smoak to the plate. Sam Gaviglio earned a no decision after pitching five innings for the Blue Jays, giving up two runs on four hits, striking out four. Jose Fernandez, Jake Petricka, Tim Mayza, Mark Leiter Jr., Joe Biagini and David Paulino all came out of Toronto's bullpen, with Paulino picking up his first win of the season.